I’ve been intending to post this for a while now, but better late than never! 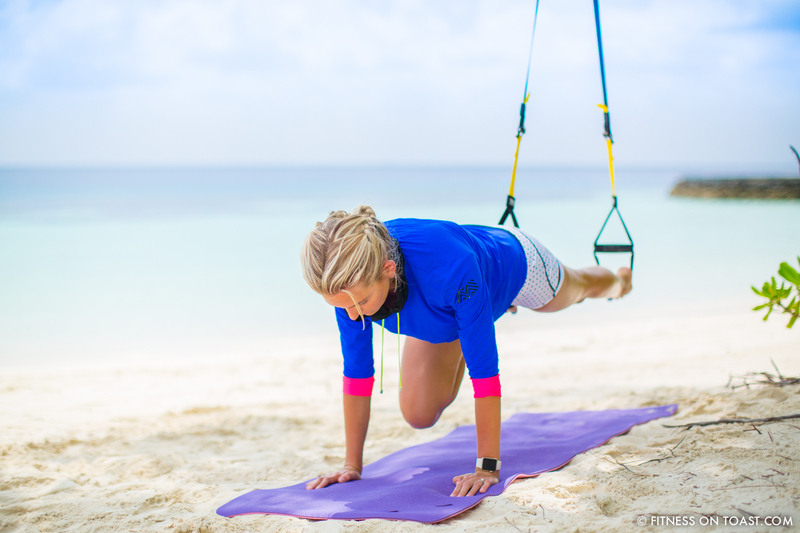 The TRX is one of my favourite pieces of ‘fit kit’– not only is it light as a feather so that you can pop it in your bag & bring it wherever, but it also allows a full body workout pretty much anywhere. 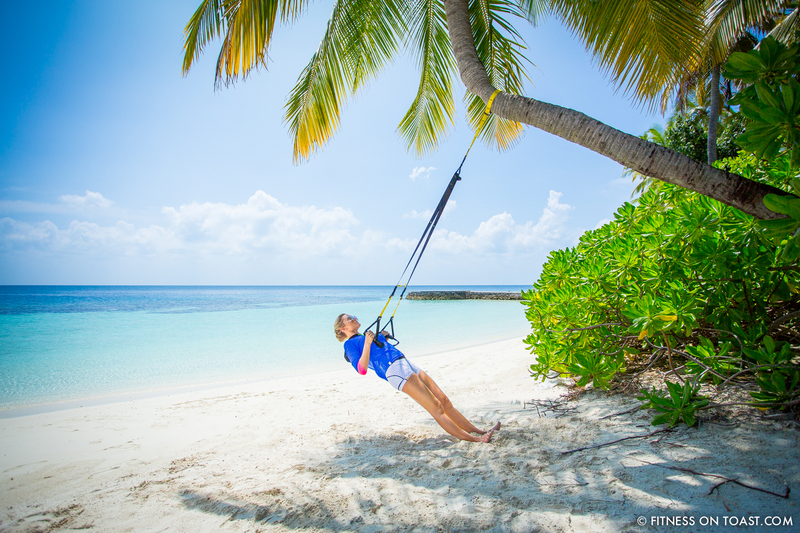 Right at the end of last year, I tied one to a leaning palm tree on the W Hotel island in the Maldives and powered out a full body session in tropical conditions – it was my first beach workout of its sorts, but it won’t be my last, as the experience awesome! This post runs over the benefits of this brilliant piece of equipment along with the full-body routine from my beach session! TRX stands for Total-body Resistance eXercise, and was originally used by militaries as a serious form of strength conditioning. You’ll now see them hanging in almost every gym and even in many a tree (or palm tree) in your local park! It’s a great way to get some much needed vitamin D, fresh air, and great for people-watching 😂. Though obviously, it also serves a more serious, heavyweight fitness purpose; using gravity and your own bodyweight, these two connected nylon straps with handles help raise the heart rate, get you sweating, build strength, refine balance and enhance core stability, all at the same time. It’s a perfect example of what the industry likes to call ’functional training’, which is essentially any exercise that mimics every-day human movements – unlike for example, some of the stationary machines you’ll find at the gym. This means you’ll have improved strength to call upon for actual, practical requirements! Here’s my little routine from the beach session I enjoyed recently. With all the movements, you’ll want to ensure the strap is tight throughout, with no slack in the bands whatsoever. Targets: Specifically, upper back and arms. 1. Regardless of whether you’re standing or are more parallel to the floor you want to almost imagine you’re in a vertical plank position. Keeping your back neutral (avoid arching or curving the back), keeping your abs nice and tight whilst activating your gluteus. 2. Make sure your palms are facing inwards throughout and your wrists should stay neutral. 3. With the row however, you really want to active your upper back by rolling your shoulders back and gliding your shoulder blades down your back, and away from your ears. You want to feel your upper back firing up. This is sometimes harder than it sounds as many of us will sit down all day typing, and thus have less muscular ‘awareness’ in that region. 4. Slowly and in a controlled manner, keeping your elbows tucked into your sides, pull yourself up towards the TRX’s pivot point, keeping your body rigid (in the plank position). Avoid arching your back or flaring out your chest. 5. Once you reach the finishing position at the top, hold it for a few seconds and then slowly lower yourself back towards the ground. Alternatives: With the TRX typically the closer you get to the ground the harder it become. So for example with the row below depending on where you position yourself you can increase the difficulty level! Targets: This move targets your whole body but specifically core and arms. Depending on the speed at which you go, it’ll really get your heart rate up and get you huffing and puffing. 1. Start by popping your feet in a strap each. 2. Then manoeuvre yourself into a full plank position, with hands directly under your shoulders, keeping your abdominals nice and strong. 3. Then slowly and in a controlled manner, bend one knee at a time and draw it up under your chest and back down again. Swap for the alternate leg, and do the same on that other side. This is one repetition. Keep it going, at pace, until failure! Alternatives: You can also bend both knees simultaneously under you. Or both legs under you with a twist. Targets: Quads, Hamstrings, Gluteus and core. 2. Slowly lower yourself towards the ground, imagining that you’re about to sit down into a chair behind you. Keeping your upper body strong, focus on posture – roll your shoulders back and down. Maintain a neutral spine. 3. Make sure your knees aren’t ahead of your feet. 4. The TRX advantage at this point is that it allows you to get down really deep in the squat by encouraging a more extreme low-point, offering a backstop for balance, and crucially, providing a spring-board to energise the jump back up. It encourages improved posture, and targets not just the legs, but also the abs and arms too. Alternatives: Add a jump as above! And go deeper if you have strong knees and don’t experience any pain. Targets: chest, shoulders and triceps. 1. Start by standing such that you’re facing away from the TRX attachment point. 2. Hold the handles in front of you, with palms facing down. 3. Engage your vertical plank position again at about 45-degree angle to the floor. 4. Slowly lower your chest toward your hands. 5. When your hands are in line with your chest, stop. 6. Slowly and in a controlled manner, push yourself up. That’s one rep. Aim for 3 sets of 10 reps. Targets: Triceps – N.B. 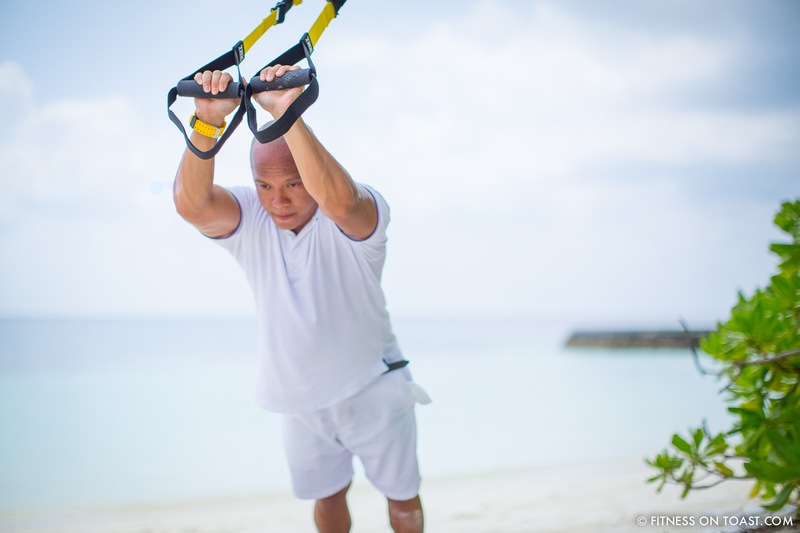 that’s not me above (in case you couldn’t tell), but the awesome Head Trainer at the W Maldives, Mark Angeles. 1. Stand facing away from the attachment point, and hold the handles over you head with bent elbows in line with your shoulder, hands facing forward. Ensure your wrists are aligned (not bent). Your hands should be positioned near your temples. 2. Slowly lower your body toward the ground, keeping a vertical plank position. As you lower your body, keep the abs nice and tight. 3. The movement should be one slow and controlled movement until your hands are back at the starting position whilst straightening your arm until its fully extended. 4. Then pull yourself up to starting position. That’s one rep! Try to aim for 3 sets of 10. 1. Start by interlocking the two handles together. Then place the right foot in the handle. Carefully turn to face away from the attachment point. Ensure your left foot is firmly planted on the ground, pushing the ground down below you (no heels should be coming off the floor). Your knee should feel nice and stable. Try to avoid the knee collapsing inwards or outwards. 2. Now slowly and in a controlled manner bend your left knee, lowering your body towards the floor, keeping your core strong until the leg its parallel to the floor. The suspended leg should bend simultaneously. 3. I keep my opposite hand extended upward for additional balance. Unwind the position and repeat a further 9x. That’s one set, alternate legs, and do the same. Then complete a further 2 sets on both legs! Alternatives: to progress it try and do the move more explosively! I’ve always been really intimidated by TRX, but it looks so much fun! I can imagine that you’re seriously burning your muscles and toning up like crazy when using them! Love that these photos were taken at the beach! I hear you, they look intimidating, and it’s hard to know whether you’re ‘doing it right’ at the start. A single ‘orientation’ session with a pro should see you comfortable to get the benefits from it for years to come!! I just finished an office building in Ann Arbor and their fitness room has a dozen of these hanging from the steel trusses. Pretty cool. That’s my kind of office building!!! Will have to stop by when in the neighborhood for a cheeky workout! Thanks for sharing such informative blog looking very helpful for those who wants to enter in the health and fitness world. Pleasure, and glad you liked the article. I have wanted to start using TRX bands for so long but didn’t know where to start! thanks so much for this. also, beautifullll workout space. I would have been so distracted haha! I recently heard from a woman I know that TRX is a great way to workout! This looks cool! 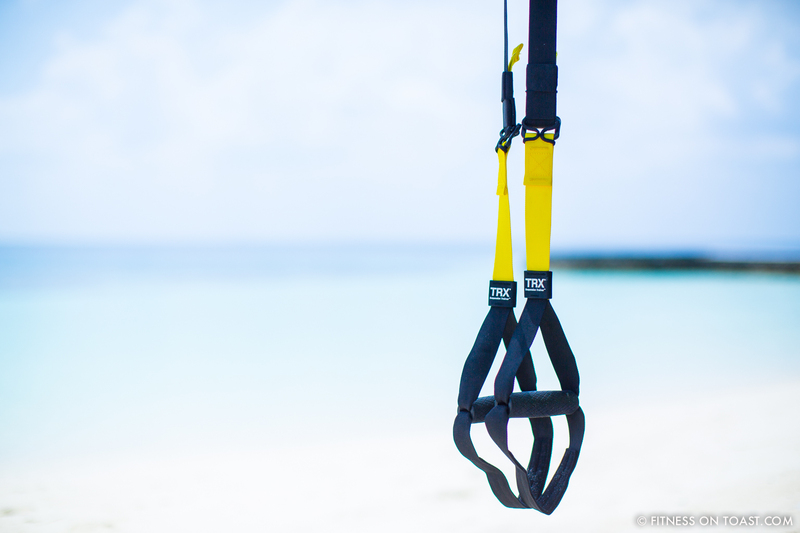 TRX Training is making its way into more and more fitness facilities, home gyms and group fitness classes (indoor and outdoor) than ever before. Thanks for sharing. I LOVE TRX, it’s such a great workout and you can do so much to modify exercises to make harder and easier!! My triceps always burn the day after I do the tricep press! Great post again, thanks for all your tips!